Status: Uncommon casual irruptive winter visitor statewide. Documentation: Specimen: annectens, UNSM ZM7630, Oct 1916 Mitchell, Scotts Bluff Co.
Taxonomy: There are 13-17 subspecies recognized by various authors (Phillips 1986, Gill and Donsker 2017, Clements et al 2017, Pyle 1997, Walker et al 2014). However, descriptions of the ranges of these subspecies vary among the various authors and are difficult to reconcile, especially those of annectens and macrolopha. In general, however, annectens breeds in the northern Rocky Mountains south to northwestern Wyoming, and macrolopha; in the southern Rocky Mountains, from northeastern Utah and southeastern Wyoming southward (see map in Faulkner 2010). Breeders in northern Utah, between these ranges, are apparently intergrades (Phillips 1986). Reports of its breeding in the Black Hills of South Dakota are unsupported (Tallman et al 2002, Phillips 1986, Faulkner 2010). Early Nebraska ornithologists seemed uncertain about subspecies assignment of the available Nebraska specimens and personal sightings; annectens, diademata, and macrolopha; were all invoked (Bruner et al 1904, Swenk 1918b, Tout 1947, Rapp et al 1958). It is not known which Nebraska specimens were examined by Phillips (1986), who revised the ranges of the various Interior subspecies. Although the nearest Wyoming population is in the Guernsey State Park area (Faulkner 2010), only about 30 miles from Nebraska, these are of the subspecies macrolopha, which, oddly, is unrecorded in Nebraska. Available evidence suggests that Nebraska birds are annectens; Phillips (1986) assigned Nebraska specimens to this subspecies, which breeds south and east to northwest Wyoming and winters irregularly to northwest Nebraska. Photographs of several that appeared in Scotts Bluff Co during winter 2012-2013 were of the Rocky Mountain subspecies annectens and there are two specimens of annectens taken in northeastern Kansas (Thompson et al 2011). However, Walker et al (2014) pointed out that “During irruptions, flocks apparently are composed mainly of immatures, which may have originated from areas much farther north”. Thus, it appears likely that annectens from higher elevations in northwest Wyoming is more prone to move downslope in winter, and sometimes erupt, than lower-elevation macrolopha; which appears to be strongly sedentary. The specimen cited above (see Documentation) is labeled diademata, an epithet currently used for populations in the southwestern US (Phillips 1986, Walker et al 2014). Winter: There are about 37 reports of Steller’s Jay, about 27 of which are from the Platte River Valley, east to Lincoln Co, in the period 11 Aug-30 Apr. Of the remainder, two are from the east, Lancaster and Nuckolls Cos, in years when the species was recorded in the west, three are from the Pine Ridge in Sioux and Dawes Cos, and four from the Sandhills. This species apparently enters Nebraska via riparian corridors, primarily the North Platte River Valley, and is usually seen in towns or at feeders. The nearest Wyoming population is only about 30 miles from Nebraska; these are of the subspecies macrolopha (Faulkner 2010). Reports of single birds in winters other than those listed above are: 15 Oct 1936 in Lincoln Co (Tout 1947), specimens HMM 2906, collected at Oshkosh, Garden Co 4 Dec 1918, and HMM 2799, collected at Kearney, Buffalo Co 13 Sep 1914 (Swenk Notes Before 1925), one at a Scotts Bluff Co feeder 18 Oct 2018-31 Mar 2019, and two at Lake Ogallala, Keith Co 6-7 May 2000 (Brown and Brown 2001). The largest number reported was a flock of about 35 birds in Scotts Bluff Co 1969-70, 12 of which were counted on the CBC 20 Dec 1969 (Cortelyou 1970). Multiple reports came in the winters of 1946-47, when flocks of up to seven were seen in Lincoln Co (Middleton 1947, Collister 1947) and one wintered as far east as Superior, Nuckolls Co (Day 1947), 1985-86, when several sightings were made in the Scottsbluff area, Scotts Bluff Co (Cortelyou 1986), and 11 Aug 1996-13 Apr 1997, when up to eight were reported at various locations in Scotts Bluff Co. In the winter of 1962-63 this species was reported in Lincoln Co in the period Nov-19 Apr, and as far east as Lancaster Co 6 Jan 1963. There was a localized irruption of up to eight into Scotts Bluff Co in winter 2012-2013; the only report away from there was one at a feeder at Lake McConaughy, Keith Co 8-17 Nov (Brogie 2013). A repeat irruption was noted in winter 2013-2014, as up to seven were found in fall (Brogie 2014), at least three wintered, and the last one reported was seen 13 Mar. There are two records of birds wintering at Pine Ridge feeders, and two sight reports there. One was at a Chadron, Dawes Co feeder 9 Nov 1973-8 Jan 1974 (Rosche 1982) and another wintered at a feeder in Sowbelly Canyon, Sioux Co 24 Nov 1989-13 Apr 1990 (Grzybowski 1990a, 1990b). One was seen Apr 1891 in the Timber Reserve west of Fort Robinson by Bruner (Bruner et al 1904), and another was seen by Bruner and Swenk in Warbonnet Canyon, Sioux Co 9 Aug 1905 (Swenk 1906). Steller’s Jay does not occur in the Black Hills; there are only two South Dakota records (Tallman et al 2002). There are four additional reports, all from the Sandhills. These are from Antioch, Sheridan Co 15 Feb and 26 May 1931 (Swenk 1931a, 1931b, Rosche 1982), Sheridan (or Grant) Co 26 Apr 1936 (Swenk 1936), Sheridan Co 10 May 2009, and one was reported in Logan Co with no date or details (Johnsgard 1980). 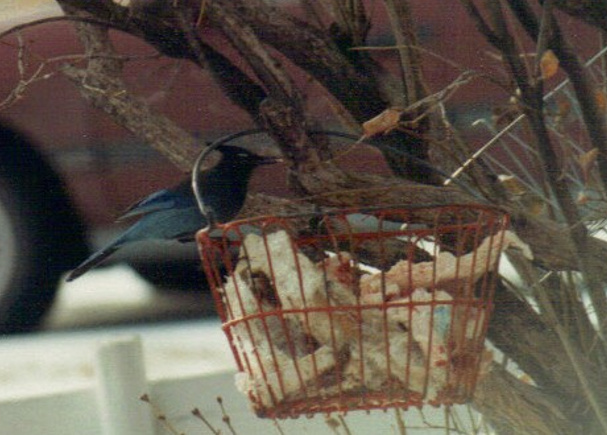 Photograph (top) of a Steller’s Jay at Sowbelly Canyon, Sioux Co 9 Dec 1989 by Mark A. Brogie. Cortelyou, R.G. 1970. 1969 Christmas Count. NBR 38: 1-15. Cortelyou, R.G. 1986. 1985 (Twenty-eighth) Fall Occurrence Report. NBR 54: 7-25. Collister, A. 1947. Long-crested Jay in Lincoln County. NBR 15: 18. Day, M. 1947. The Long-crested Jay at Superior, Nuckolls County. NBR 15: 18. Grzybowski, J.A. 1990a. Southern Great Plains Region. American Birds 44: 114-117. Grzybowski, J.A. 1990b. Southern Great Plains Region. American Birds 44: 454-457. Middleton, A.D. 1947. The Long-crested Jay in Lincoln County. NBR 15: 41. Phillips, A.R. 1986. The known birds of North and Middle America. Part 1. Denver: Phillips. Swenk, M.H. 1931a. Letters of Information 60: 9. Swenk, M.H. 1931b. Letters of Information 61: 3. Swenk, M.H. 1936. The 1936 Migration Season. NBR 4: 43-47. Walker, L.E., P. Pyle, M.A. Patten, E. Greene, W. Davison, and V.R. Muehter. 2016. Steller’s Jay (Cyanocitta stelleri), version 2.0. In The Birds of North America (P. G. Rodewald, Editor). Cornell Lab of Ornithology, Ithaca, NY, USA. .